A NASA team spent three days camping on an asteroid recently. Well, that's what it must have seemed like to them. They were actually close by, in NASA's Space Exploration Vehicle prototype (SEV), parked at the Space Vehicle Mockup Facility at the Johnson Space Center. 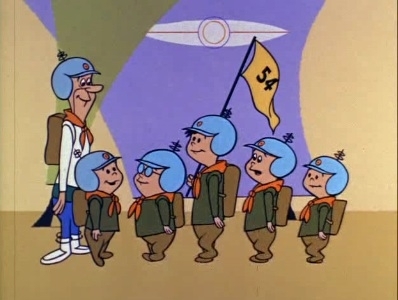 Fans recall The Good Little Scouts, an episode of the cartoon series The Jetsons aired in 1962. The only way George can get a vacation from Mr. Spacely is to accompany Space Cub Troops #54 on their camping trip on the moon. George finds himself lost, but is rescued by Mr. Spacely's son, Arthur. Fans of SF Grandmaster Robert Heinlein recall his wonderful story Misfit, which is (as I recall) his first published story (1939). It tells the story of how an asteroid was wrangled into a more useful orbit, and then set up as a space station, by a group of young recruits. Via Daily Telegraph; thanks to Moira for sharing this cool story!